Make sure you are a follower of our blog (click on 'join this site' in the right column) Only our followers can win our prizes. PS - you can still participate to win the prizes from Friday & Saturday too!!! Scroll down to see those posts as well. All winners will be posted on Monday! I love the colors and the rich look of the papers. Love Quick Quotes! I started out buying quotes at the Quick Quotes booth at the scrapbook convention when it came to St. Paul. Its so hard for me to journal sometimes, and your quotes were just what I needed. Then there were the canvas kits, so beautiful! I love the new paper lines and seeing what your design team does with them, so inspiring. I would love to win! WOW, I would love to win all 4 new lines. How cool! Thanks for a chance to win. Great stuff. I am a follower of the blog too. I love the colors and the richness of these collections, so beautiful. I also love how versatile the papers are. I've been a follower for a short time, but I love QQ. I would love to win. I love all your beautiful paper and the diecuts. I love the colors and patterns you use. Wow all 4 of your great papers. That would help get a lot of layouts done. Love working with your paper and embellishments. Thanks for a chance. I just love pretty paper (it's an addiction) I love Miss Morgan! Everything about it is great! The colors are wonderful and your design team is very inspiring! Oh wow it would be so fabulous to win all that paper. I am working on getting my scraproom finished and this would be a awesome addition. i love how each paper line is so unique, but yet so versatile that you can interchange the lines! Oh wow....please pick me for your new papers! I love you products. I loved all the wonderful QQ classes I just took in Tulsa. Cannot wait to attend more QQ classes in the future....they are definitely my favorite!! I am a follower and am new to the papers. Love the colors and patterns! I know I could put them to good use. Long time QQ fan here. Always love your new papers and quotes. I tend to go for the brighter colors. Love your products and the look i achieve in my scrapbooking. Thanks for the opportunity! I love all of your paper collections. Beautiful paper and embellishments. I received the Miss Morgan line of papers a few weeks ago and absolutely LOVE them. They are my first QQ products to work with. I love the quality of the paper and the fact that they are double sided. Winning more would be amazing!! I love all your products and I love double sided design paper. I love the quality of your papers and the doublesided designs which give me more leeway when working. I also love having sets that go together since I am color/style challenged. I absolutely love the designs and color combinations on the QQ paper. I just wanr to get my hands on them and create somethin Aaah-may-zing!!! I just love the fact that Quick Quotes is all about family :-) Plus the easy quotes if I don't feel like coming up with anything, teehee! Love the colors in your 4 new stacks! Pick me, pick me:) !!! and - I luv u guys!!! I Love the Paper Kits, by useing them I have finished four Albums this year. I would love to win. But if I don't I will be at Grand Mound again this year any-way. See you there. I love the color combinations and the diversity of the paper. Some of them are vibrant and playful, others are muted and have a more vintage tone. There's something for every scrapbooking occasion! Variety, variety, variety, love it. btw, thanks again for a great Private Reserve in Novi. I've not seen your items before, but I love what I see!! I love the Black & White Damask line in your new collection!! Thanks for a chance to win!! i love the colors in the miss morgan line (and the name is pretty great too). I love your papers and all of your stuff, but also love your guys' story. My name is Amber Cartner-Eastman and hear about how your business got started from my mother in law, Phyllis Eastman. And I know how successful you simply by looking at your website and following you on Facebook. What an inspiration to a fellow crafter. I think my favorite new paper is french quarter. It's so elegant and versatile! But my favorite overall is 2011 Julie Je T'aime I love the bright colors! I love the quality of the QQ products. The look is amazing but you don't have to worry over the quality or quantity of paper and embellishments in your kits either! First, and before I forget, I am a follower. I love all of these collections for several reasons. I love that they are all so different from one another and from most things on the market right now as well. I have the French Quarter papers and the quality is exceptional! (I haven't had the chance to make anything with them yet but I have an awesome mini album as well as an altered piece or maybe a canvas piece in mind.) I also love that they are 2-sided, meaning you get more bang for your buck and more options that coordinate together. I also love that they are so versatile. There are patterns that work well for any kind of project you can think of whether it's card making, scrapbook layouts, altered art or whatever... there's something there for everyone. I don't think they can be beat in any of the above categories. I would think I was in heaven if I won ALL 4 collections! Wow, QQ's paper is fantastic!! I love the colors, the quality!! I have took many classes of QQ at the CKC, and the pages we had created were awesome!! All your products are wonderful!! Thanks so much for this chance to win your awesome paper and embellishments!! Those papers look absolutely gorgeous! I love the colors and the variety of lines! Thank you so much, would be in paper heaven if I won! The reason why I love quick quotes, is because you stand out from the rest. Your products are unique and fit my style of paper crafting. I'm so excited to see your booth at the conventions I attend, and even more when I know that I can order your products on-line. thank you for the products you create for us. I like that your designs are fresh. I just received this months kit but haven't had time to play yet. Honestly I am new to QQ. My friend had some at her house so I decided to check out your blog and joined in the fun here. I LOVE what I saw of hers and I LOVE, love the French Quarter and Cherry Truffle lines the most. Just the names make you want to check them out! I would be honored to win all 4 of these lines because the would inspire me to create and provide me with mojo! i love the inks, and the glitter sprays! I used the spray at ckc and liked how it did not clog and was a fine mist. The inks are so portable, yet don't fall apart like some other companies small ink pads. I am new to QQ but what I see is beautiful! Love Miss Morgan -pretty hard to find sophisticated lilacs and lavenders - most prints are overly girly but yours just rock. So yes, if I win, Iam happy to pay shipping to Canada - I'm sure my scrap group would be blown away by how pretty your papers are. I have used QQ paper lines for some time now and everytime someone see one of my layouts that always admire the paper.I love the feel of QQ paper and the colors are always awesome. Thank you so much for bringing these new lines to us. I love the paper the color and designs are super cute. I would love to be able to try them out in person. I love the colors and designs. Also the quotes are so prefect. I another thing I love are the powder puffs. I have made tons of the canvas and love them as gifts. I love how all the papers go together keeps me in the color wheel. I had one of the most wonderful therapeutic weekend in months because of Quick Quotes. I loved getting to play with the new Radiant Mists, you have to try them! The French Quarter paper has to be one of my all time favorites, so far. It was great to the QQ team. Until next time. I like all 4, but French Quarter is my all time fav. I love QQ classes. Always learn something new. This year at CK Mesa, I took 5 classes. I showed my tabs at the QQ booth and received some fantastic product. Thank you Patsy. 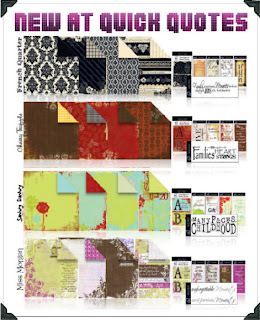 QQ is always one of my favorites - never miss you at Scrapbook Expo. Papers and other products work so well together. Colors are gorgeous. Sorry - previous post (#68). Eunice Lee. Not to try to put in an extra entry - just hit enter before typing in my name. I love the vellum Quotes and use them alot in all of my scrapbooking.